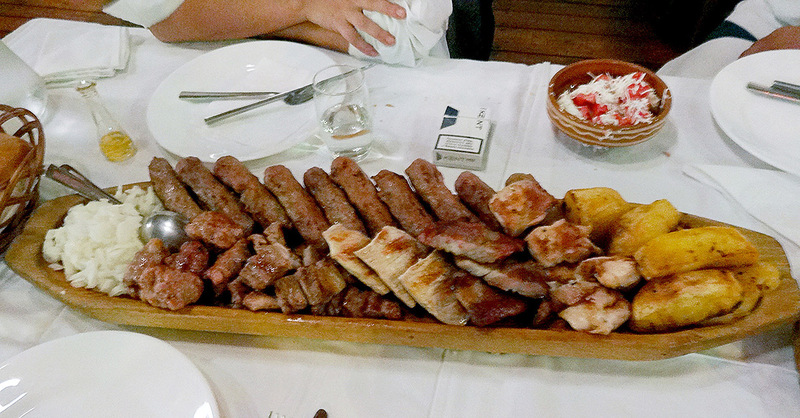 The foodie traveler's guide to Serbian food • Where Is Your Toothbrush? Like many cuisines of Central Europe, traditional Serbian food is an amalgam of homegrown flavors and influences from the country’s neighbors and friends, invaders and occupiers, and travelers and visitors throughout history, particularly (Ottoman) Turkey and (Austria) Hungary, as well as (Byzantine) Greece and Bulgaria. Because of the continental and Mediterranean influences and the similarities to the cuisines of other Balkan countries (Serbia has been called “a crossroads of nations”), it can be impossible to trace the origin of many important dishes in the Serbian cuisine; versions of many, like sarma, can be found all over the region. 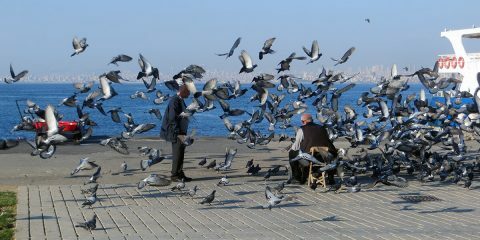 (Ottoman) Turkish influence is most pronounced in traditional Serbian dishes like ajvar, burek and sarma as well as in desserts like baklava and the drinking of coffee; Hungarian influence particularly in the northern region of Vojvodina and in soups, desserts, and spirits; Greek influence in dishes like musaka; and Bulgarian influence in the šopska salad. Many regions have their own specialties or variations of traditional Serbian food. 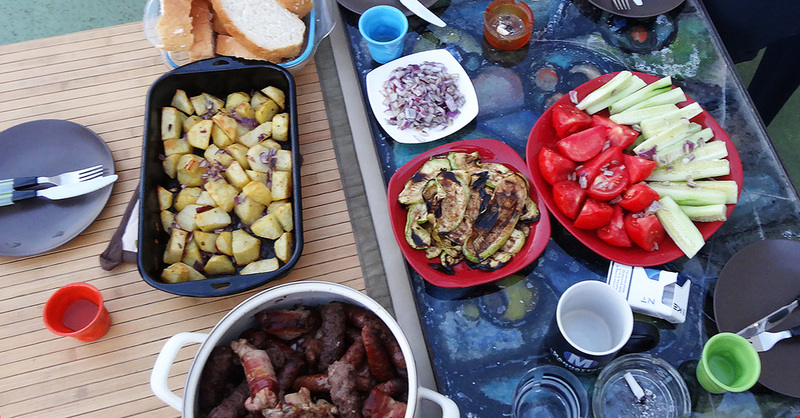 The foundation of Serbian cuisine rests on meat (particularly grilled), dough, and dairy, testimony to the traditional occupations of the Serbs, like animal husbandry and food crop agriculture. The carnivorous traveler will appreciate Serbia the most; the vegetarian will be steered toward pastries and cabbage, with a few salad standbys. At the same time, Serbian cuisine makes abundant use of vegetables, be in salads like šopska, spreads like ajvar, or in pickled form. While staple Serbian dishes like burek or sarma offer hearty sustenance year-round, many seasonal dishes are best at specific times of the year, e.g. strawberry jam in the spring or ajvar in the fall. Serbian cuisine uses few spices beyond salt and pepper, instead relying on the natural flavors of fresh ingredients and their combinations. The only exception is Vegeta, a commercial all-purpose seasoning blending salt, spices, and dehydrated and ground vegetables. More so than in many European countries, life in Serbia centers around food. In other words, Serbian traditions feature food as a core element. In traditional village homes, the kitchen with the hearth was located at the center part of the house, forming the heart of family life and a gathering place for all. Whenever we get together with our Serbian friends, food inevitably appears. 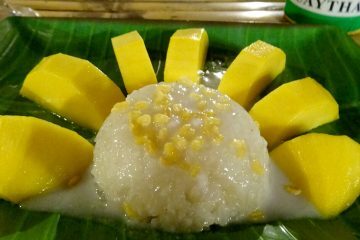 A curious foreigner whom a host invites for a drink will have the occasion to notice a difference between us and other nations—that we, while having a drink, eat. The main family holiday in Serbia, the slava (Patron Saint Day), centers around a special cake and culminates in a big, multi-course (and sometimes multi-day) feast. Serbs eat three main meals a day, breakfast, lunch, and dinner, with copious amounts of coffee and occasional snacks in between. Historically most recent in the country, introduced in the second half of the 19th century, breakfast in Serbia tends to be the smallest meal in Serbia. At home, Serbian breakfast can be as simple as a pastry and a cup of coffee, but more often involves crusty bread, kifle / kифле (roll), or other dough delicacy, e.g. proja / проја (Serbian cornbread), with various combinations of spreads, cold cuts, sausages, and eggs prepared as hard-boiled, scrambled, or omelette. Specialty Serbian breakfast dishes include kačamak / kачамак (polenta AKA mamaljiga in other Balkan countries), often served with sausage, and popara / попара, a pauper dish made of dry bread, cream, and cheese, served with sour milk. In cities, many people eat breakfast on the way to work or school, grabbing a burek, gibanica, or one of several kinds of sweet pita (pie) at a pekara (bakery) or a plejskavica from a street kiosk or stand (see below for the description of these dishes). In Serbia, lunch is the most important meal of the day. The main dish/entree tends to be meat-heavy, with grilled meat a particular favorite. Soup is a must in the Serbian diet. “In order to be a success, the business lunch in Serbia has to present our national cuisine in all its variety to foreign guests. After opening with cheese, salami, ham, olives, cheese pie, spinach pie, boiled pit-heads with horse radish and veal broth, which is expected to expand our guests’ stomachs so they can continue eating, comes the main dish, the crown of the meal—a roast pig with an apple in its mouth and small green peppers in its ears. kajmak, an untranslatable, idiosyncratic cross between butter and clotted cream or cream cheese (but don’t call it cheese) to lighten the meat or bread dishes. An entire food group of must-have items in the Serbian kitchen come in a jar. Serbs pickle or preserve almost anything: vegetables (tomatoes, peppers, peas, cucumbers), fruit (plums, figs, cherries, apricots, grapes) and fruit peel, wine leaves, and so on. “Serbian vegetable caviar” ajvar is the king of preserves. Jams are also popular, as a spread on a breakfast bread-and-butter or for dessert as slatko (see Serbian sweets and desserts below). Like many Slavs, Serbs are most hospitable when it comes to food. Not only does Serbian food accompany all social occasions, shot glasses and plates get constantly refilled. Protest is futile. Soup in Serbia belongs to every lunch, and is sometimes also eaten with dinner. Serbs believe soup is good for you. Thin Serbian soup, called supa / супа, is based on a broth made from beef or poultry and is most typically served as the first course. Thick Serbian soups, called čorba / чорба, are made with roux. Much more filling than supa, čorba can serve as a standalone meal, particularly if it contains meat. od zelja / од зеља (cabbage), od spanača / од спанаћа (spinach), od koprive / коприве (nettle), od zelja i sira / од зеља и сира (cabbage and cheese), paradajz / парадајз (tomato), and od boranije / од бораније (green beans) among the vegetable ones. Right here at this little turquoise storefront in the heart of Skadarska, Belgrade’s bohemian quarter, you’ll find some of the best goulash in Serbia. Common among Eastern European countries, goulash is a meat stew seasoned with whatever spices and ingredients the particular country is known for in their dishes. In Serbia, this typically includes paprika, bay leaves and chili pepper along with onions, tomato paste, olive oil and sometimes potatoes or carrots. 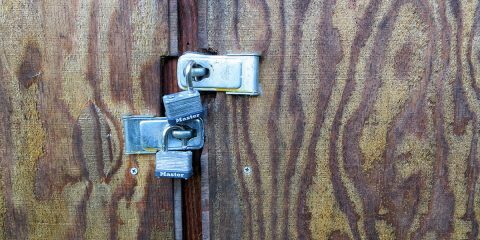 The owner of the restaurant, a sweet motherly yet assertive lady with jet-black hair, spoke only limited of English but filled her shop with the most amazing smells of a seriously delicious goulash, where the meat seemed to just melt in your mouth. She must have seen how much I was enjoying her goulash because before I could say anything, she waltzed on over to my table and slopped me up a second helping for free. But let’s be real, I wasn’t complaining! Pasulj / пасуљ [pah-sulyi], literally “bean,” is a (white / pinto) bean soup with the addition of smoked meat like sausage, bacon, or ham hock. Also known as the Serbian bean soup, it gains some color from the additions of carrots, onions, and paprika. A much thicker version, a casserole called prebranac / пребранац [preh-brah-nats], requires hours of preparation. The beans are baked, the onions caramelized, and the meat absent. Riblja čorba / рибља чорба [rib-lya chor-bah] is the Serbian version of the Hungarian halászlé. The Hungarian-born soup is particularly popular in the formerly Hungarian region of Vojvodina, in the north of Serbia. It is a hot paprika-red, spicy concoction made with three types of riverine fish, including and especially catfish. 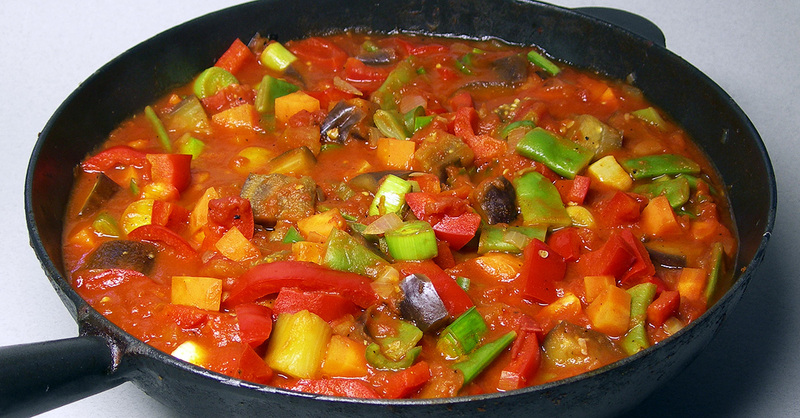 Đuveč / ђувеч [djoo-vech] is the Serbian version of the Turkish güveç, similar to the French ratatouille. Named after an earthenware pot it was made in, it remains a one-pot dish, easily made in a slow-cooker. Like many a stew, đuveč ain’t pretty, but it’s very filling. …in any number of combinations, layered in a pot or deep-dish pan. Vegetarian versions of this Serbian stew omit meat. Mućkalica / мућкалица [mooch-kah-lee-tsa] is a Serbian stew made from grilled pork meat and vegetables, best served with pogača / погача bread (see below). The dish is particularly popular in southern Serbia; the most popular, perhaps even the original, version comes from the town of Leskovac, hence its common name Leskovačka mućkalica. 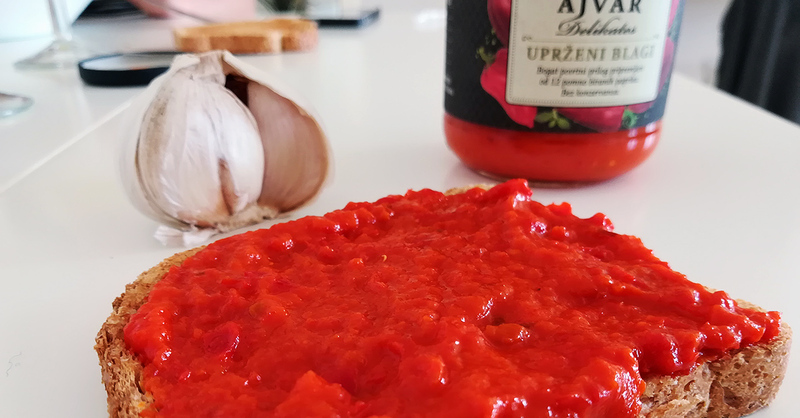 Ajvar / aјвар [ay-vahr] is a spread (if ingredients are blended) or salad (if ingredients are chopped) made of roasted red bell peppers, eggplant, garlic and sunflower oil. 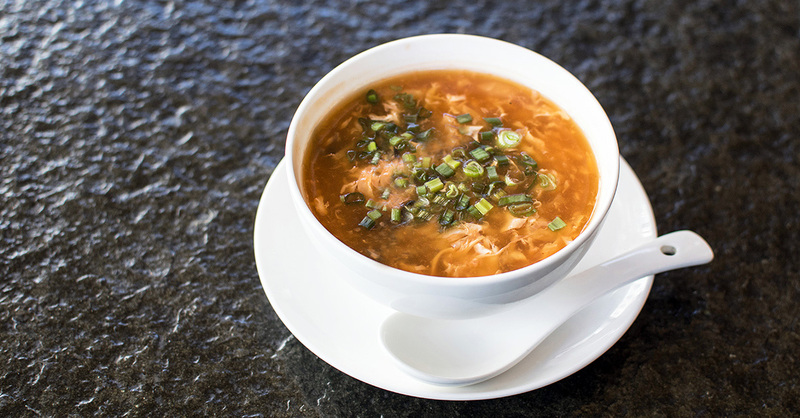 The spicy version contains additions of chili peppers. As a spread, ajvar is served on bread and is sometimes called Serbian vegetable caviar (“ajvar” etymologically originates in the Turkish “havyar” meaning caviar). As a side dish ajvar is also called Serbian salad and is a bit player in Serbian meze or as a garnish for grilled meat. Serbia is said to produce some 640 tons of ajvar. In the fall, during harvest season, drying red bell peppers cover the walls of buildings around Serbia and later lend the air a distinctive scent as they get roasted in ovens, stoves, or on an open fire. The skin gets peeled and the flesh ground and mashed with other ingredients. Ajvar is available outside of Serbia in jars, often sold at specialty or international grocers, as a spread. Similar to ajvar, pinđur / пинђур [pin-djoor] is a spread / salad made with eggplant rather than peppers. A type of pita / пита (pie), burek / бурек [buh-rek] is a staple breakfast dish made from layers of phyllo dough enveloped in an outer dough layer. While the most traditional burek has no filling, the best versions of Serbian burek contain fillings like cheese (burek sa sirom / бурек ca cиром – cheese burek) and/or minced meat (burek sa mesom / бурек ca меcом – meat burek). Many burekdžinicas (bakeries specializing in burek) also offer versions of burek with other fillings, like mushrooms, spinach, or fruit. Best served with thin Serbian yogurt, which makes it easier to go down. A 15th century Turkish dish, Serbian burek differs from the Bosnian version in that it is made with pig fat, round, and served in wedges, most often quarters of the entire pie. By contrast, Bosnian burek is made with vegetable oil, rolled, and coiled (motani). Bosnian burek is available throughout Serbia as sarajevska pita (Sarajevo pie) or bosanska pita (Bosnian pie). The Serbian town of Niš hosts an annual burek-making competition called Burekdžijada (loosely, Bureklympics). 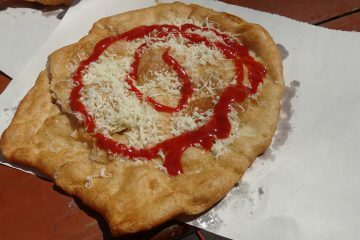 The event saw in 2005 the largest burek ever made, measuring at 2 meters in diameter and 100 kilograms. Tender, flaky, pillowy dough encasing a variety of delicious fillings, from savory mushrooms to tender spinach to creamy potatoes, and all at bargain prices of under $1…who could say no to vegetable burek? 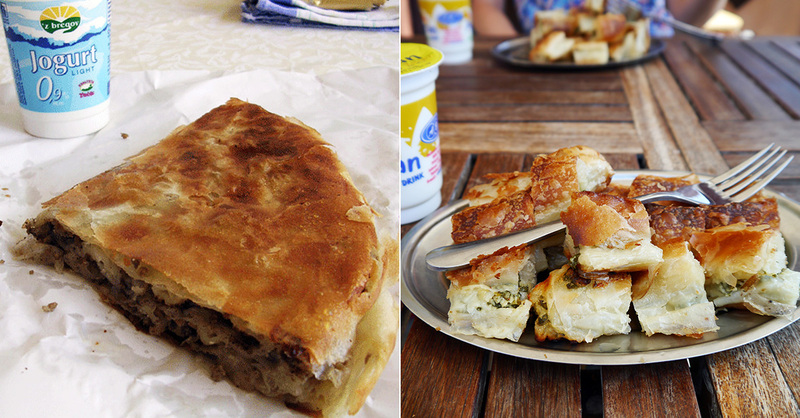 I ate a lot of burek in Serbia, and not just because it was cheap, filling, and widely available. There’s a big selection of vegan burek during Lent, when I visited, labelled posno (meaning Lent fasting food). Burek is available in both sweet and savory forms and consists of a filling wrapped in phyllo pastry and baked. 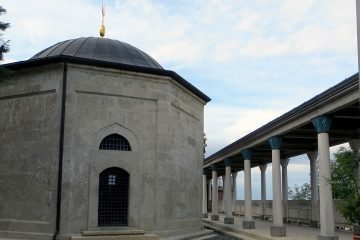 It’s believed to have its origins in Turkey and its presence in Serbia belies Serbia’s Ottoman past. 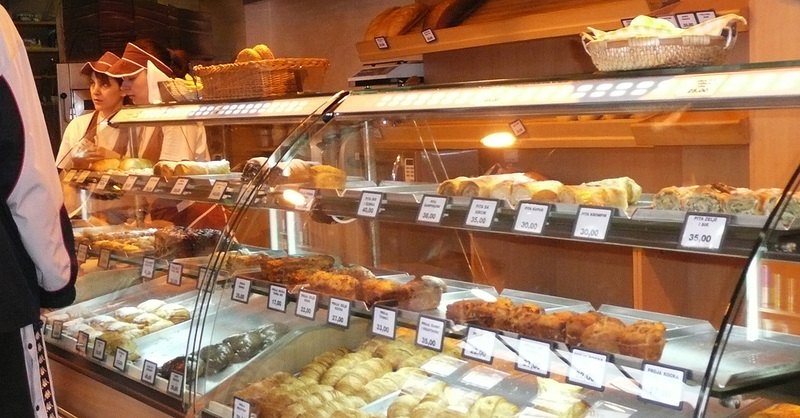 These days burek, also called pita, are available in every bakery in Serbia. Potato burek became one of my favourite pastries during my travels in Serbia, because of the contrast of smooth, fluffy potato with the crispy phyllo pastry and the carb-on-carb goodness of it. Gibanica / гибаница [ghi-bah-nee-tsa] is a type of Serbian pastry, similar to burek but basically a type of strudel-like Serbian cheese pie, made with phyllo dough, cottage or feta cheese, and eggs. 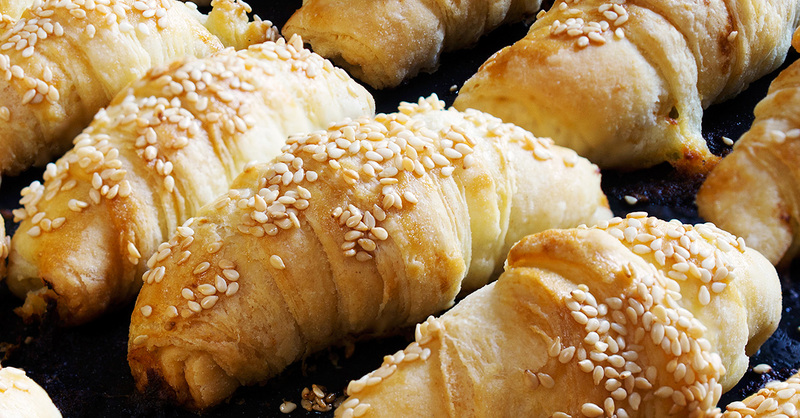 The sweet versions of gibanica may contain apples, poppy seed, or walnuts. 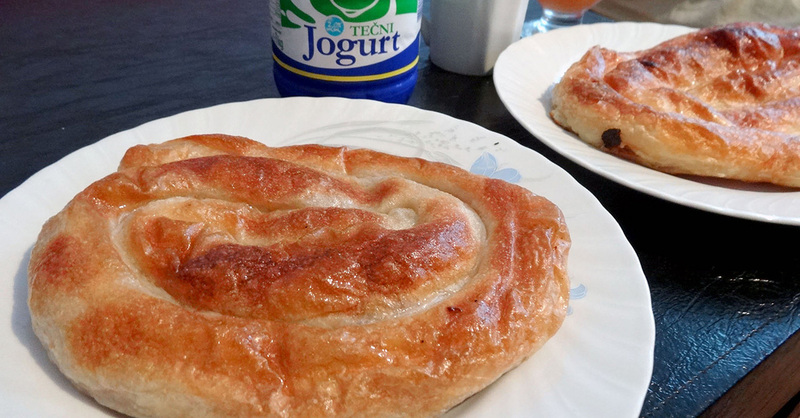 As many other Serbian snacks made of dough, the gibanica cheese pie is best served with kefir or drinking yogurt. 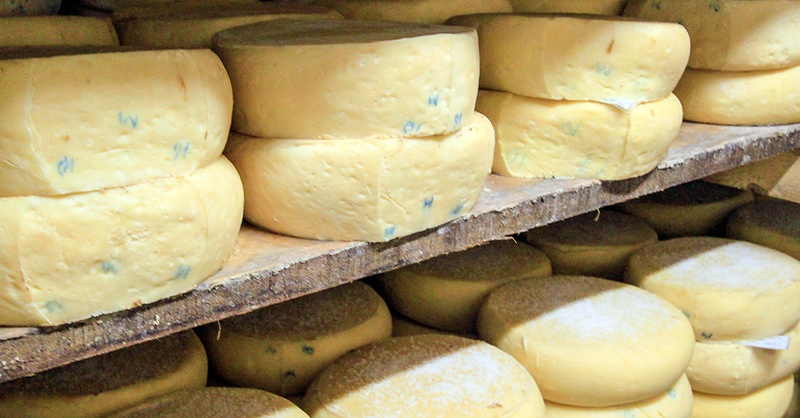 Cheese in Serbia is either named by its animal (cow, sheep) or region, even town / village, of origin. Whereas in other Balkan countries it’s an umbrella name for all yellow cheeses, in Serbia kačkavalj / качкаваљ is a hard, yellow sheep cheese. To be called that, Serbian kačkavalj must be made in the city of Pirot, in Southeastern Serbia, hence its alternate name Pirotski kačkavalj / Пиротски качкаваљ. If a pound of cheese cost 500 euros, would you buy it? Such is the price for pule / пуле (foal), a rare smoked cheese made from donkey milk. The most expensive cheese in the world, pule is made from the milk of jennies living in the Zasavica nature preserve, in the southern part of Vojvodina. Alas, the cheese is not for sale. Meze, in the words of the Serbian writer Momo Kapor, is something Serbs eat while they drink. 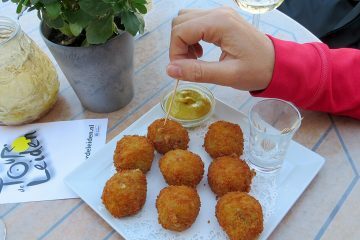 Meze is also a delightful appetizer course, particularly popular in rural Serbia. The concept of a meal consisting of an assortment of small plates and appetizers, and its accompanying word, arrived in Serbia from Persia via (Ottoman) Turkey. But where the Turkish meze includes cooked dishes, Serbian meze only features non-cooked items like cold cuts, cured meats, sausages, fresh or pickled vegetables, and olives. As we already mentioned, Serbian cuisine leans heavily toward meat, and within the meat category toward grilled (barbecued) or roasted meat. 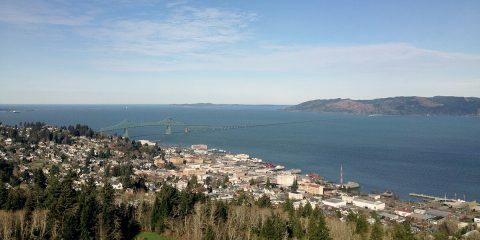 In this historically agricultural land, cattle and especially pigs have been at the center of meat culture. Beef and pork dishes are the most common meat dishes in Serbia (lamb and fish dishes tend to be Montenegrin in origin). Ćevapi / ћевапи [che-vah-pee] AKA ćevapčići / ћевапчићи [che-vahp-chee-chee] is a dish of meat that’s minced, shaped into rolls, and grilled. Serbian ćevapi are typically served on a plate with a side of chopped raw onions, kajmak, and flat-bread. The name of this dish, which is ubiquitous in all of Balkan food, originated in Persian kebab, but the dish itself is of Ancient Greek origin. 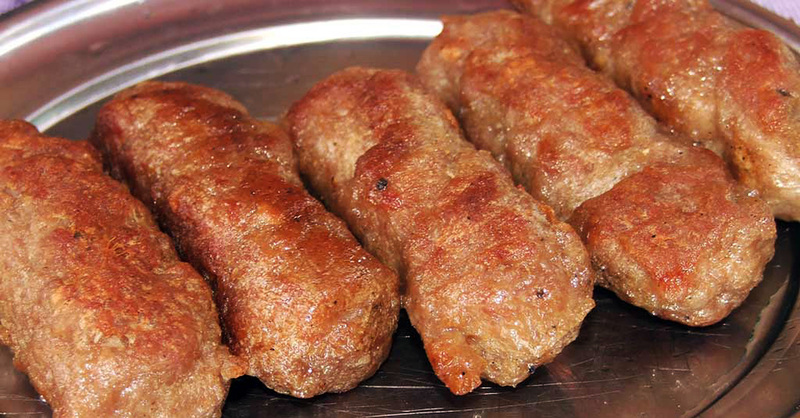 Serbian ćevapi are longer than in Bosnia and include pork. The most famous version of Serbian ćevapčići comes from the town of Leskovac. Karađorđeva šnicla / Карађорђева шницла [kara-george-eh-vah schnitz-lah] is a piece of roasted roasted veal or pork meat stuffed with kajmak, breaded, and deep fried. The chef who created it in 1959 named the dish after the Serbian king Karađorđe because it resembled the royal’s medal. Testimony to Serbia’s macho culture, the dish is sometimes referred to as “a girl’s dream.” We’ll let you figure that one out on your own. 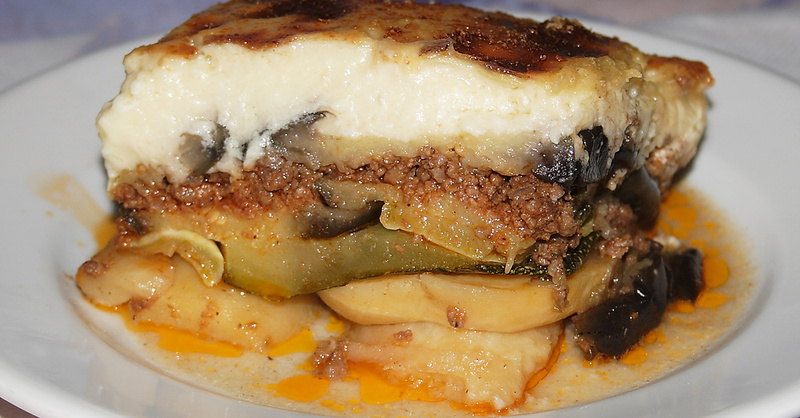 Musaka / мусака [moo-sah-kah] is the Serbian version of the Greek moussaka, consisting of layers of potatoes (rather than eggplant as in the Greek dish), ground lamb or beef, and tomatoes covered in battered egg (instead of white sauce) and baked in the oven. Pljeskavica / пљескавица [plye-ska-vee-tsa] is the Serbian version of the hamburger and one of the major national dishes. It’s heavy and filling and comes down to this: ground pork or beef shaped into a patty, grilled, and stuffed in a flat pita-like bread called lepinja with accoutrements. 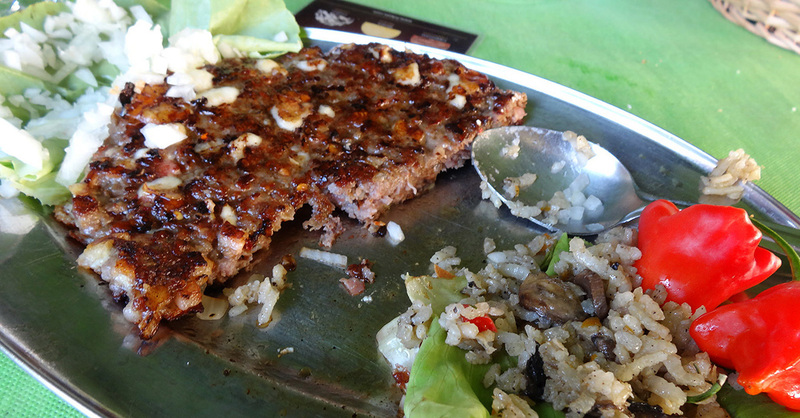 Serbian pljeskavica can also come on its own on a plate like a steak, with sides piled on alongside it. A popular Serbian street food, it is ubiquitous throughout the Balkans. Sarma / сарма [sahr-mah] is a staple dish of Balkan food, and you’ll also find it in Turkey (the origin of the word is “to curl”) and beyond, as dolma. Cabbage being a staple vegetable, it’s no surprise really. Serbian sarma consists of a cabbage leaf wrapped around a mix of minced meat (most often beef) and rice. In some, particularly southern, parts of Serbia, grape leaves are used, betraying Greek influences. Other versions of Serbian sarma use chard; grains like bulgur may replace rice. Best served with a side of sour cream (pavlaka). Talk about prep! Unlike a typical German style sauerkraut, this Serbian dish uses large leaves of cabbage so as to create a large wrap. For the filling of the dish, varying combinations of ground meat, spices, and rice are all combined and then wrapped up in the sauerkraut leaves. It is then all placed in a pot to begin the simmering process. Like so many good things in life, sarma is certainly worth the wait and is one of the must-try dishes when visiting Europe! The version made in Herzegovina is called japrak / јапрак [yahp-rahck], made with a special varietal of cabbage called raštika. Rather than a course, salad in Serbia is a side, eaten alongside the main course. Ubiquitous throughout Serbia and the Balkans, Šopska salata / Шопска салата [shop-ska sala-tah] is a cold Bulgarian salad, invented in the 1960s and named after the region called Šopluk, which straddles Serbia, Bulgaria, and Macedonia. In some areas it is called Bulgarian salad. Šopska salata is a staple of Serbian restaurant menus and often a go-to for the vegetarian traveler when it comes to Serbian food. Srpska salata / српска салата (Serbian salad) is a cold salad often served alongside grilled meat in the summer months. 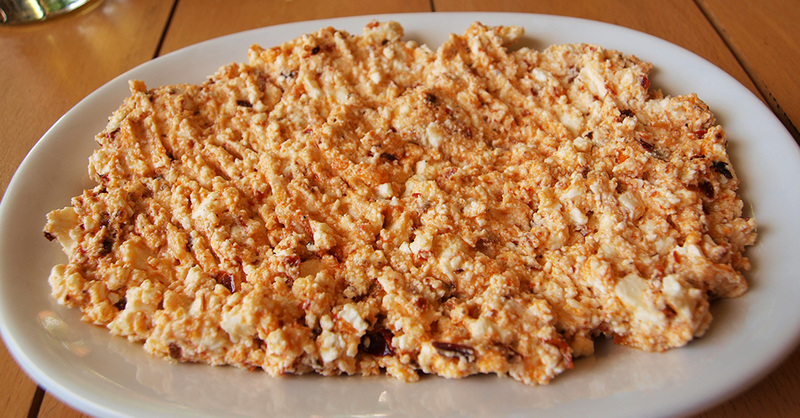 Urnebes / урнебес [ur-neh-bess] is a South-Serbian salad made with white cheese, hot chili peppers, and garlic. 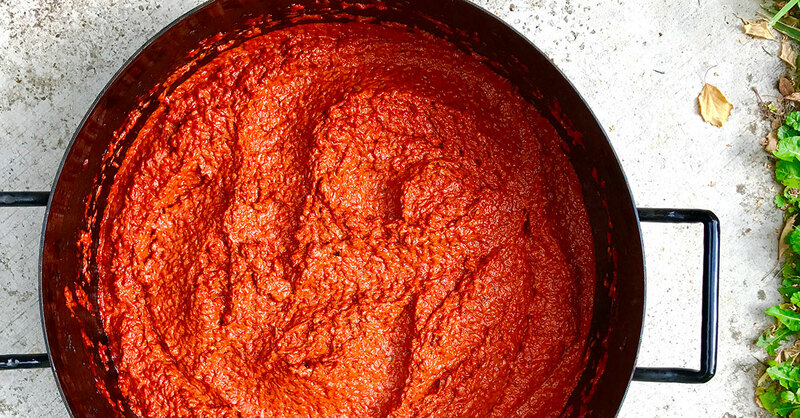 Like ajvar, it can be made either with chopped or blended peppers. Urnebes a great accompaniment to grilled dishes. If Serbian cuisine shines with meats, it positively sparkles with sweets. Serbian dessert comprises a number of sweet treats, many of which were brought to Serbia throughout history. Many Serbian sweets use or come in a variety using ground Plazma biscuit, sold in the West under the brand name Lane; Plazma is also used as a dessert seasoning for some Serbian desserts, like crepes. While a number of dishes claim the mantle of the Serbian national dish, the Serbian national drink is but one: rakija. In other words, rakjia may as well be the synonym for Serbian alcohol. Rakija / ракија [rah-key-ya] (sometimes transcribed as rakia) is a distillate (brandy) made from a variety of fruits. Commercial varieties are typically 40 percent alcohol by volume, while home-made versions are often much stronger. By far the most popular type of rakija is šljivovica (slivovitz), made from plums. A number of plum varietals are used for making šljivovica. The best šljivovica is made with požegača AKA Hungarian plum, growing in the Valjevo, Kraljevo, and Čačak regions, or crvena ranka, which gets its name from its reddish hue. Serbia is world’s top 3 producer of plums, growing some 42 million plum trees on 150,000 hectares of land; some two thirds of all harvest goes into making plum rakija; 95 percent of all šljivovica produced in Serbia is home made. Serbia’s first registered patent, in 1909, was a machine for making rakija. Why plum brandy and not something else? [I]ts strength is reflective of the character of the people who make it. Slav somberness and melancholia, not to mention explosive emotional states… Apart šljivovica is the only drink that prompts Serb farmers to piously cross themselves before drinking. 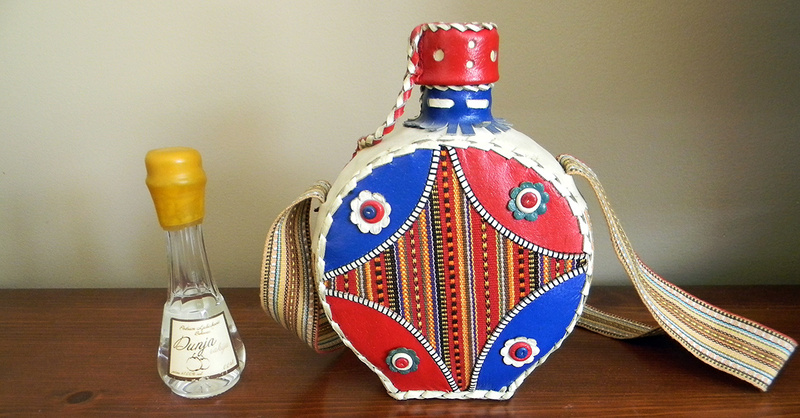 Rakija is a beverage for all occasions in Serbia, both happy and sad and everything in between: as an aperitif and as a digestif, as a welcome or a farewell toast, at weddings, in the morning as a preventative cure. Rakija is also sprinkled on graves at funerals. Wine takes a servant, rakija a master. The traditional way of serving rakija is in a shot glass with a wide base, to contain the spirit, and narrow neck to prevent alcohol from evaporating. Šumadija tea is considered as prevention for the flu or the common cold. Pelinkovac is a digestif liqueur made from wormwood (artemisia). Bitter in taste and lower in alcohol content (28-35 percent), pelinkovac is nowadays mostly made in Croatia. Serbia is not a beer culture the way Germany or the Czech Republic or Slovakia are. Though beer is popular in Serbia, particularly in the summer, local tastes concentrate on light lagers and pilsners. Most beer in Serbia is mass-produced by three foreign-owned breweries, which control 95% of the market, and two dozen smaller breweries scattered around the country. The Belgrade Beer Fest and the Dani Piva (Days of Beer) festivals as well as advertising by beer majors have increased the popularity of beer in Serbia in recent years. …and a number of other foreign brands produced under a license, including Nikšičko (Montenegro), Staropramen (Czechia), and the usual suspects Stella Artois, Tuborg, Heineken, and Beck’s. Though Serbia is not exactly known for its wine, wine-making has a millennia-long tradition here. 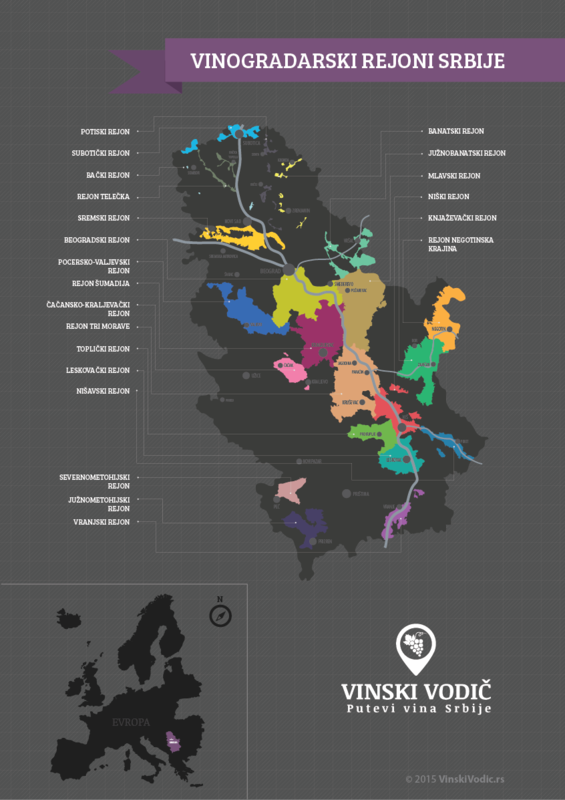 Serbian wine can be categorized by varietal or by region. The major wine-making regions are Fruška Gora, Kruševac, Negotin, Palić, Smeredevo, Srem, Vršac, and Župa. A number of familiar varietals like Burgundy, Riesling, and Sauvignon are also used to make wine in Serbia. Serbs like to say that they only drink tea when they’re sick and milk when they are breast-fed. This is a way of saying coffee rules. The most popular coffee beverage consumed in Serbia is Serbian or domestic coffee, domaća kafa / домаћа кафа [doh-mah-cha kahfa]. Also known as Turkish or simply black coffee, it’s made in a džezva, a pot with a long handle, with finely ground coffee and water brought to a simmer. The concoction is poured into a cup where the grounds must settle before you drink the coffee. Serbian coffee is mostly served at home. Out in kafanas (coffee shops) or kafićs (coffee bars), espresso and other coffee drinks are popular. Going out for coffee is a major social occasion in Serbia; best enjoyed out of doors, on patios or terraces in city centers, it entails hanging out wtih friends, smoking, reading a paper or a magazine, people-watching, or simply being seen. The oldest coffee shop in Europe, Znak pitanja (Question Mark), is located in Belgrade. There aren’t many English-language Serbian cookbooks out there. But you can still make traditional Serbian food at home with these cookbooks. I also believe that soup is good for you! I had no idea about the variety of Serbian food (cornbread? neat)… I want to try many of the savory dish recipes. We are having cabbage tonight but it’s nowhere near as interesting as these. it looks like Serbians really like the mashed food.